 Public Lab: How much are Coqui measurements affected by hot/cold water? Question: How much are Coqui measurements affected by hot/cold water? Some people don't drink water from the hot tap, because its sat in pipes and has more heavy metals. 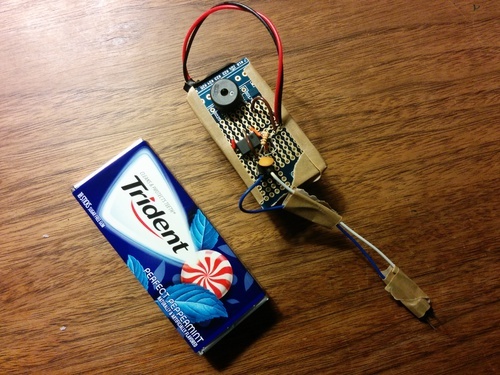 But could we use the 555-based <$5 Coqui sensor? First we had to let them equalize in temperature because that'll affect conductivity. Then we made a more durable version of the Coqui soldered on a perforated circuit board instead of a breadboard. How much is temperature a factor? Can the Coqui compensate for temperature? This'd be a great first thing people could do with such a sensor... A Hello World, and one which would have real environmental health repercussions for anyone drinking their tap water. Hey @warren @donblair and Katie - Nice work - this is simple and exciting. Our judgement was that the sounds were "the same but different" and that both hot and cold "vibrated a lot". Ah, this is all so great! This brings up a bunch of interesting issue for me that I'd love to get feedback on. Naming conventions. Maybe it'd be good to start to figure out a useful naming convention for these various projects; I'm starting to get confused :) For me, I see the Riffle, which has now been used as a basic datalogger board for several projects that don't involve water quality, as a sort of general data logger. I love Mat's suggeston of the 'Sniffle' as the air quality version; and Craig recently made a 'Muffle' version that is intended as a mushroom grow room monitoring device. Maybe we should come up with a name for the basic datalogger that is separate from any of these names? At the risk of generating two many entities to keep track of. So, Riffle Coqui starts to get even more confusing for me :) But that's par for the course when all of this fantastic development happens so quickly with a bunch of fun and enthusiastic folks! had started to move in the direction of a device that "translates a resistance value into an audio-range frequency" -- where the resistance could be a photocell, a pair of electrodes in water, a thermistor, or many other things. I'd come to think of it as separate from the Riffle, which is expressly intended as a device that measures certain standard water quality parameters. If the conductivity of the water is observed to be different for tap water samples that were obtained through 'hot water pour' and 'cold water pour', and then maintained at 25 C, what might this be due to? Is lead in the pipes the only / most likely explanation? If lead from old pipes is a concern, what concentrations are typically present in hot tap water due to lead piping, and how much would this affect the conductivity? These show the change in measured conductivity of solutions for different solutions of known conductivity, for a range of solutions that are on the high end of potable water in conductivity. 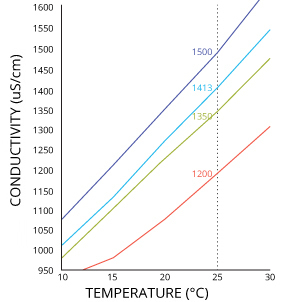 Not sure it's reasonable to use this as a rough guide, but from the chart it looks to me like conductivity of these solutions changes by about 30 uS/cm per degree C. Since this temperature effect seems to be larger for higher conductivity solutions, and this is on the high end of potable water conductivity, let's use this as a conservative estimate. 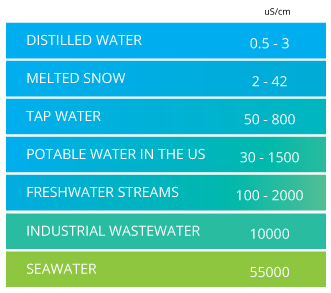 My conclusion is: a difference of a few degrees Celsius (meaning a change of 100 uS/cm or so) isn't going make tap water (50 uS/cm to 800 uS/cm) appear to be in the conductivity range of industrial waste (10,000 uS/cm), or sea water (55,000 uS/cm); but it seems like it can push us around the typical range of tap water by as much as 15% of the expected range. For assessing incursion of seawater into a freshwater water source, it looks a difference of a few degrees in the samples isn't going to matter much when making comparisons. Great, thanks Don. I can change the title/body to reflect whatever name you think is more appropriate -- "Coqui-based water conductivity sensor"? I forgor to mentinon that this test made it really clear to me that you have to dip the probes all the way in to get a consistent tone -- making me want to put a 'water line' mark on the probe stick. Probes partially submerged or even submerged in bubbly water didn't generate a clear tone. We didn't have a thermometer on hand, but left the water at room temperature for over 30 minutes, and finger-dipped to check the temperature difference. Finger-dipping, while a time-honored accessible method from the caveman days, should be tested itself -- if we want to make a simple kit, what's an acceptable temperature difference between two glasses, and does a finger-dip get you in that range? Hi Warren, I am new at this, so maybe I missing the ball, but isn't one of the reason why not to drink from the hot tap the possible presence of Legionella bacteria? Hi, Don - sorry, you never wrote back so I hadn't changed the title until now - it now says "Coqui" only - thanks. it seems like it can push us around the typical range of tap water by as much as 15% of the expected range. is great, even if you have since drawn a more precise conclusion. And the graphics are super helpful! Could you add them to the Coqui page, which is a bit sparse on these kinds of limitations at the moment? It mentions "conductivity" but not whether it's absolute or comparative, and not how it's affected by temperature etc. I added a Status and Limitations section to the Oil Testing Kit as we talked about on Wednesday; maybe these could be part of such a section on the Coqui page, too. Hi, @GreenChemist - I don't know - do you have more information about that? If so, I don't think this would test for that, just the metals. Hi Warren, Indeed the test would not find the bacteria, you need a polymerase chain reaction (a PCR test), or grow a culture. I am not sure if this can be done in the scope of public lab. I just wanted to mention it here to point out that the conductivity might give some people a false assurance about the safety. It's a good point -- esp. always to be sure that the scope of the test is clear. The idea here was more exploratory, but in general this kind of conductivity test is not a test of drinkability or safety -- just an indicator of comparative change. I've seen some DIY PCR work -- have you done any of that kind of thing? What's your interest in tapwater research? So both questions and research notes can be marked as an activity? And at some point, folks replicating the activity can post their answers? I like this idea for this and bigger questions! Actually i haven't tried marking a question as an activity; i guess it works? Maybe not a good practice? I dunno -- new territory for us! As to your other question, I think you're right and it's ambiguous. Changing the title now, but shall I post another question about the other? I'm actually having trouble editing this page -- must be a bug due to it being "converted" to a question instead of being one from the start. I've submitted a bug report with steps to fix: https://github.com/publiclab/plots2/issues/885 -- sorry!